During an interview, Kenyan Gospel artist, Masterpiece, expressed his feelings for Kenyan socialite, Huddah Monroe. Kuna dada mmoja pale mimi namlike sana anaitwa Huddah. Namlike kama crush kwa sababu wanawake wachache sana wako kama yeye. Masterpiece confessed he indeed had a crush on the socialite because she is smart and doesn´t compare to other ladies out here. She is a very smart woman na mwanaume kuwa na mwanamke smart kama yeye basi maisha yako iko sawa. 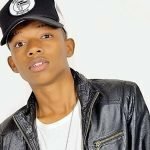 The Gospel kid further assured that he will keep her in his prayers and that he is always on the look out observing Huddah´s steps. Huddah mahalipopote ulipo mimi ni msanii wa kizazi kipya wa injili na nakufuatilia sana nitakuombea sana na nitakupeleka kanisani utaokoka. Masterpiece boldly pointed out that he desires to take Huddah to church, and get her converted. Singer, Kagwe Mungai had also earlier on taken this route, expressing his feelings for the Kenyan socialite. We let her decide. The post Vibrant Kenyan Gospel artist confesses having a crush on Socialite Huddah Monroe appeared first on Ghafla! Kenya.